The Junkie from Bubblebum is a whole new level in back seat storage and tidying for your children. Designed to go especially well in between two car seats, it'll hold your drink, your snacks and your tablet, as well as providing desk trays for 2 children to work on, plus places to store anything else you might need to keep the kids occupied on your journey. We were sent a Junkie to review, and while I think the name is a bit awkward, it really does convey the idea very well. This is the most techno back seat organisation system ever. 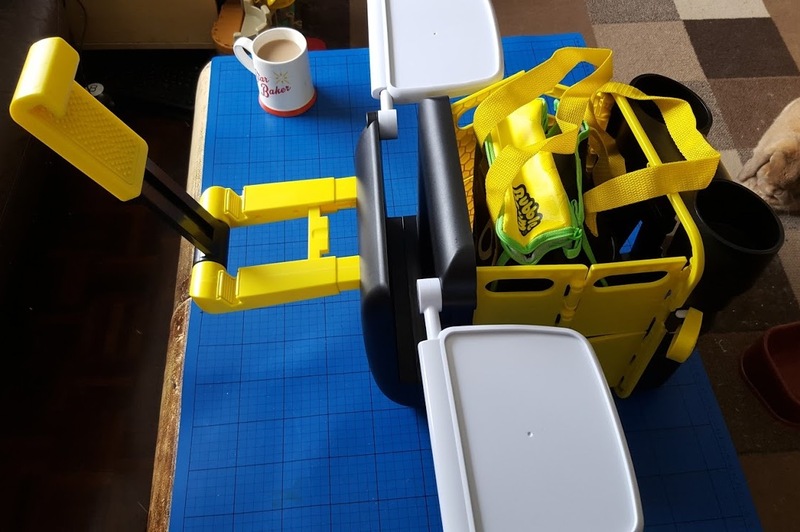 The Junkie is light and neat, and when folded away takes up a very small space - around the size of a child's backpack.It's secured in closed position by a large yellow clip either side. 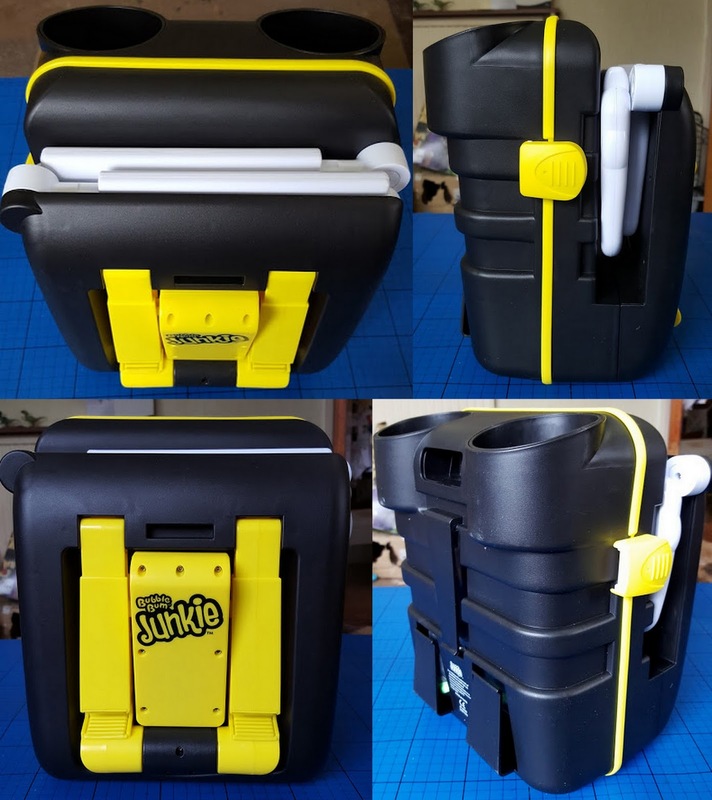 Expanding the Junkie is super-simple and can easily be done in situ in your vehicle in seconds. Unclip, pull the front forward and then fold down the base and let it drop into place. Putting away the Junkie is the reverse operation. There are two small trays or desks which fold out and extend slightly to sit in front of your children. They are high enough to fit over the wings of our child's car seat, and large enough that they are useful for older children who want to write and draw. Also included is a handy tote with an insulated cool compartment. It's nicely made and should last okay, wipe clean and a really nice touch for snacks and essentials when travelling and for transporting your gear from the house to the vehicle. The Junkie also has a 'tech mount' to hold a device. This is massively adjustable and perfectly strong enough to hold your tablet while the children watch a movie in the back. 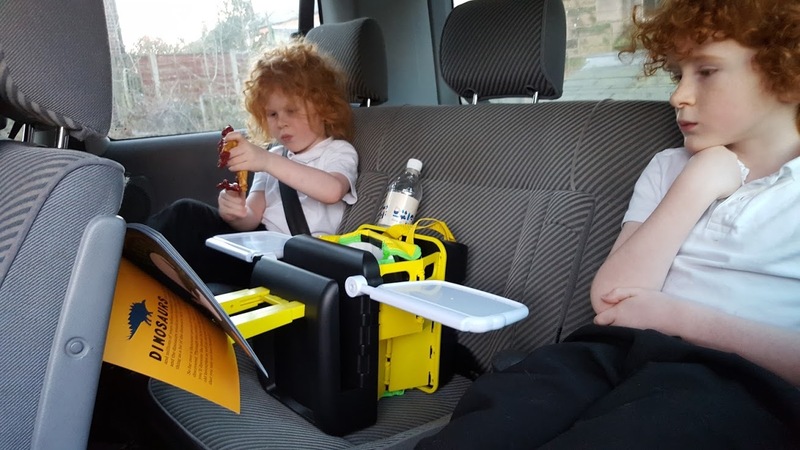 Because of how the Junkie is fixed into the vehicle it can't tip over and your tech will be in reach from the front seat more easily than by the children! They say the devil is in the detail, and actually there are some very clever touches to the design of the Junkie which really make it ingenius. This little clip only moves a short distance, yet will hold the tech mount steady when expanded, and will also lock it shut when not in use - preventing your children from messing with it! 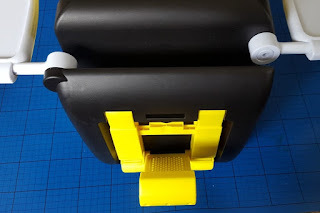 The Tech Mount has a great texture that safely and securely holds your items without damaging them, and fine adjustment is really simple to achieve. No-one needs a Junkie, but it's a really great idea and I wish we'd had one or two for the last 16 years or so. It contains all the mess and rubbish, and means you can just lift one bag out of the vehicle to tidy and collect everything. 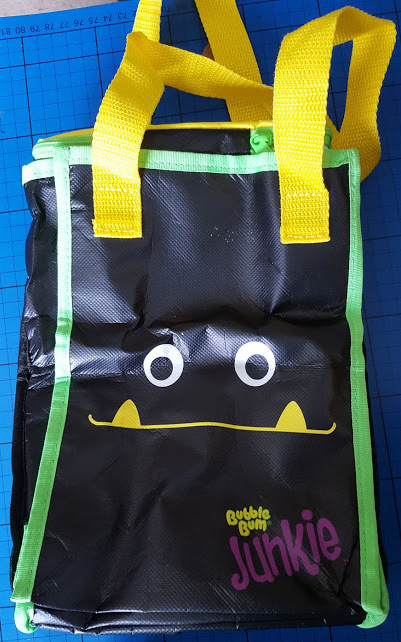 It minimises dropping and squabbling, keeps snacks and drinks handy and gives your children equal access to screens and tech, or a book in our case! 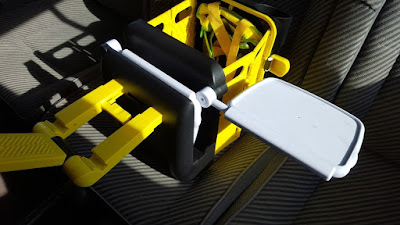 Having now moved car seats around and used the Junkie for the last couple of weeks I think it's actually super handy. 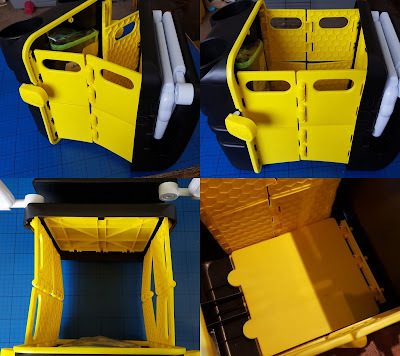 At first it was a novelty and they wanted trays in/out/in/out, but now it's just a handy thing and it'll be brilliant for going on holiday or any other long trip - for the bottle holders alone! 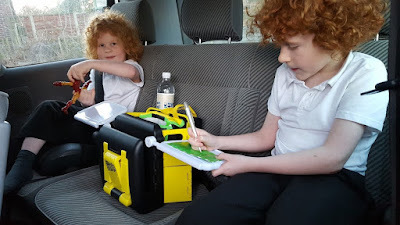 Slightly less light-heartedly, we keep travel baby wipes and tissues in the van permanently, and they actually fit into the folded Junkie along with a couple of nappy sacks - which is brilliant for my very regularly travel sick, and quite independent 7 year old. 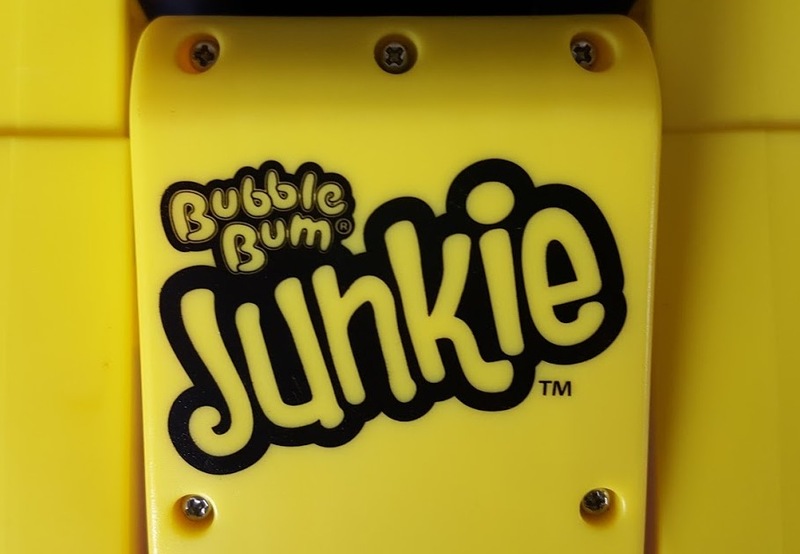 The Junkie from Bubblebum retails at £39.99. Available online with free postage and is also available at baby & child stores and branches of Halfords. We were sent our Junkie for review. It is clever isn't it! Great especially if there are two of them - I think it'll stop a lot of bickering on long trips! Love the idea of this even just having one child. 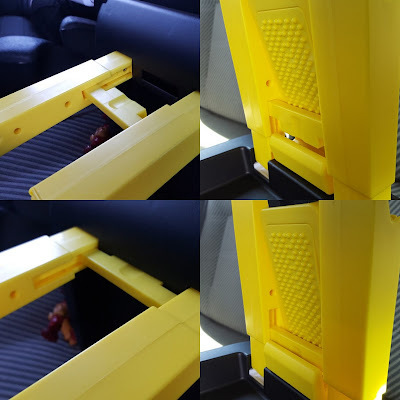 I can see it being really useful on long car journeys and when it's just the two of us in the car.